Umno! Regain your moral compass! THIS year’s Umno’s annual assembly is not in our living room, unlike previous years where there would be live coverage of the assembly for several days on national television. The assembly gets live coverage via special arrangements with certain media organisations. This year, there is no live coverage. The assembly would still get coverage, depending on the news value generated. This year’s assembly, which started on Friday night, is a subdued affair compared with previous ones. Given the defeat the party suffered in the May 9 general election, it is only to be expected that the assembly would be low-key. Datuk Seri Mohamad Hasan, the former Negri Sembilan menteri besar, who found himself to be party deputy president, officiated at the joint opening of the Youth, Wanita and Puteri wings. It was a speech coming from a party leader who made no bones about admitting the pain and agony of losing a national election. Mohamad won uncontested in his Rantau seat but he lost the state, as did many other menteris besar. Even though the speech was made specifically to Umno leaders from the three movements, I believe its content should also be taken seriously by all Umno members. 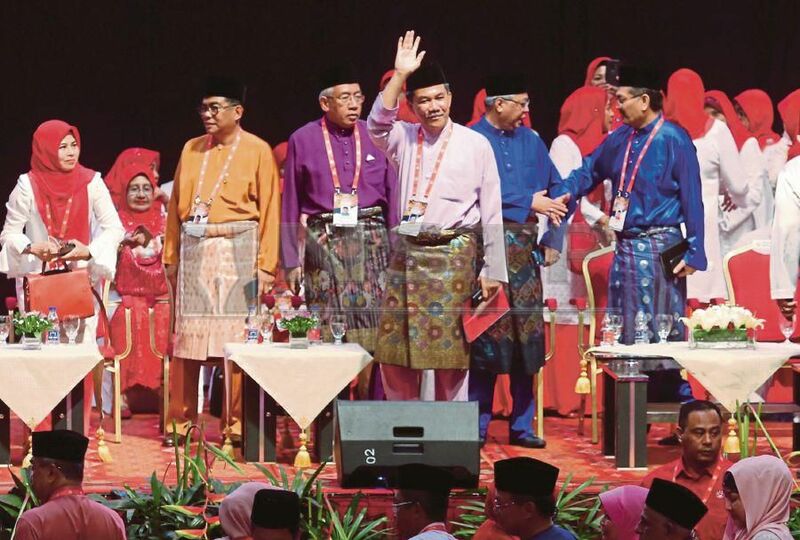 Umno may no longer be the party that had formed the backbone of the Federal Government for decades, but it remains a formidable opponent for Pakatan Harapan. It has experience, a big headquarters and ready administration, branches throughout the country and a claimed membership of more than three million. But last May 9, all of Umno’s might fell against the people’s power garnered by Pakatan Harapan and its leader, Tun Dr Mahathir Mohamad. The rest is history. Mohamad gave his reason why Umno failed. “Because we were careless (cuai) in looking after and carrying out the trust placed upon us,” he said. Short of saying that Umno had betrayed the trust of Malay voters and those who put their faith in the party all these years. He didn’t mince his words when he said that many people in Umno used the party as a source of living. Can you imagine what that means? In all the years listening to Umno speeches, this is probably the first time I hear a senior party leader saying this. There have been whispers in and around party headquarters about the very thing that Mohamad said, but no one has uttered this publicly, more so at the party assembly. post of deputy president very well. His speech, the first as Umno number two, was absent of the fiery rhetoric of previous leaders, which was most welcomed. He is not known to have taken to any rostrum with fist in the air, screaming advice or cajoling the audience to do their part to serve the party. Rather, he spoke in a sober and measured tone. This has always been the Mohamad style, often falling back on his Negri Sembilan intonation. If I’m asked which part of his speech was the most important, or which part would be the take- away, I would go for his reminder to everyone in the party to regain their moral compass. In order for Umno to move forward with a clear sense of purpose, the party must accept the defeat no matter how painful it is. Obviously Umno cannot rule for 1,000 years, he said, adding that it would take a considerable period of time before it can regain power. He told key leaders from the three wings to work hard and forget about wanting to wrest power immediately. The party was now at its most difficult crossroads and many members seemed to have lost their raison d'être for the party. Such was the impact of the May 9 defeat, many Umno members appeared to have lost direction and self-confidence. Mohamad kept repeating his call for the party to regain its moral compass and ideology, and urged members not to be easily persuaded to become pak turut, or a conformist. He must have drawn from his experience as a top international corporate leader whose outfit had lost a major contract and was now in the red. “Let us not take the easy route. Let us also not take the short cut. We need big ideas. I chose to stay in the party and work towards prolonging Umno’s life, knowing that the path ahead is filled with tough challenges and problems. “Umno’s glory days are over. Accept that, please. The years ahead are full of obstacles, and we have to look for new narration. We need new articulation of fresh ideas. We need to study the big data and use them effectively. “We need good, thinking leaders. We don’t need leaders whose ability is limited to going to the streets and shouting slogans and insulting others in the most demeaning manner,” Mohamad said. He didn’t name names but it is not difficult to guess. I don’t know. Maybe he meant that some of the antics by petty leaders make the party a laughing stock. Mohamad went on to tell members that they must accept criticisms and shed their sensitive nature. Umno’s future and relevance would very much depend on how well they adapt to life as the opposition. The writer is the chairman of Yayasan Salam Malaysia.